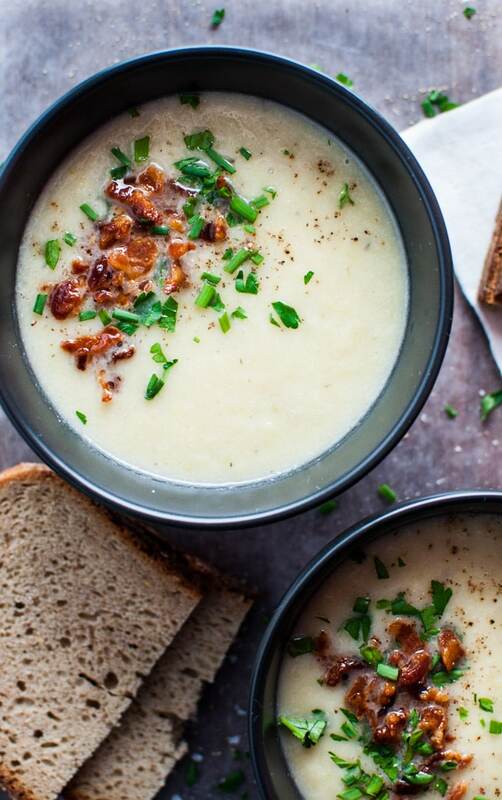 This cauliflower and leek soup is a light and healthy soup recipe that is simple to prepare and ready in only 40 minutes! Great for busy weeknights. It’s time for another soup with leeks in it! Leeks are such a great addition to soup. Yes, I know I just posted a leek soup recipe a couple weeks ago, but I couldn’t help myself from making another. Leeks are just great. I love their smooth, mild onion-y flavor. Did you know that cauliflower is a great low-carb substitute for potatoes in soup? Often, you can’t even tell the difference. 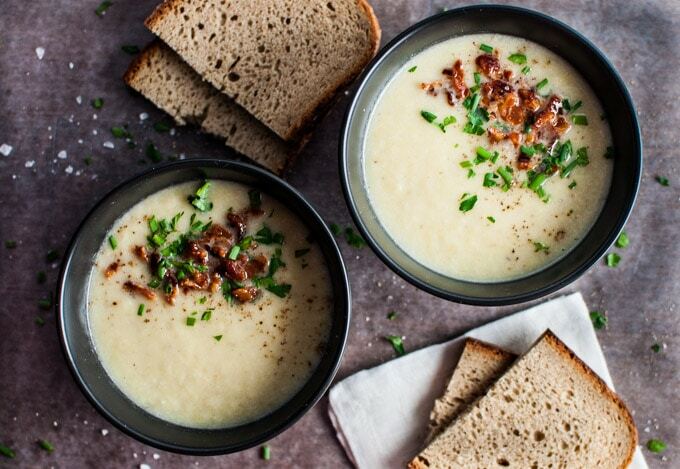 As it happens, this recipe is a low-carb cauliflower soup recipe. I used three large leeks and one head of cauliflower in this cauliflower soup recipe. I wouldn’t worry too much about the size of the leeks as they all will vary. This soup is creamy without having any cream in it. It’s light but still satisfying. I added the crispy bacon on top because well, why not!? That is of course optional. The fresh herb garnish is optional too, but I think it enhances the flavor even more. Pro tip: If you need to make this soup vegetarian friendly, simply substitute the chicken broth with vegetable broth. And cancel the bacon. I hope you will love this easy low-carb cauliflower soup recipe. Let me know if you’ve made this tasty soup in the comments below! This cauliflower and leek soup is a light and healthy low-carb soup recipe that is simple to prepare and ready in only 40 minutes! Warm olive oil and butter in a pot on medium heat. Meanwhile, prepare the leeks (discard the top green portion and cut the bulbs lengthwise into four pieces, then chop into smaller sections). Add to the pot. While leeks are sautéing, separate the cauliflower into florets that are roughly the same size. Add cauliflower to the pot. Add chicken broth, water, ground cumin, and thyme to the pot, and increase heat to high. Once the soup starts to boil, reduce to medium-low heat and simmer until the cauliflower is tender (about 20 minutes depending on the size of the florets). Once cauliflower is tender, remove from heat and puree using a stick blender (or normal blender), using caution as the soup is still very hot. Serve with optional garnish immediately. This soup looks wonderful, love the styling with the parsley and bacon bits off to one side! This looks so yummy! I’ve been amazed at all the things you can make with califlower. So delicious! Thanks so much, Kelsie! I know, it’s so versatile. I don’t cook with it nearly often enough. I love that you used cauliflower in this soup to make it thick and creamy. And of course that bacon on top. Pinning! Natasha, that bacon garnish is calling to me! I love leek soup and this one looks delish. Pinning! Oh my goodness, yes! Pinning this! My mom used to always make potato leek soup when I was growing up. I definitely need to try this healthier version! That’s great, thank you Robin. I hope you like it! What a great bowl of flavor! I love the way you garnished it, Natasha! I love everything about this soup – simple to prepare and some of my favorite flavors! Thanks so much Marissa! 🙂 I hope you try it. Thank you for this recipe! I love potato and leek soup but we’ve been trying to cut back on starches and carbs lately so this was perfect. I made this while my parents were visiting and overheard my well accomplished home cook and dad in the kitchen saying “I won’t eat that, I HATE cooked cauliflower!” After he questioned each step and asked what I was going to do with “it” he decided it was good enough to try. He’s not a picky eater at all, so when he says he doesn’t like something, he REALLY doesn’t like something. He loved it, definitely making this again! This was delicious!!! My husband said he actually preferred this to my potato leek soup!! Win!! Have you ever made this in an instant pot? This sounds right up my alley – and your photos are gorgeous! I’m going to have to put this on the menu while it’s still chilly outside. I made a few adjustments–roasting the cauliflower with cumin seeds, eliminating the water and increasing broth to 3 cups–and the result was the most delicious cauliflower soup I’ve ever tasted! I paired it with a loaf of homemade honey-oat bread, and my family raved about it! Thank you so much for the inspiration! That’s great! So glad it worked out. Can this be made in advance and not served immediately? I don’t see why not. 🙂 Hope you enjoy the recipe, Michele! Does this soup save or freeze well? Hi Katie! I haven’t tried freezing it, but I don’t think it would be a problem. Enjoy! Glad you enjoyed the taste! My husband and I still talk about this soup!